This Whole Grain Dijon Mustard Mashed Cauliflower is rich in flavor and creamy delicious. The Whole Grain Dijon Mustard gives it a flavorful power boost that will quickly become your favorite side dish! You guysssss, I can’t keep it a secret any longer! I was selected to participate in a campaign at the end of May that will give you (my loyal readers) a chance to win an exclusive trip to Dijon, France! I’m so excited and honored to be selected by Honest Cooking and Maille to offer one of you a chance to win this amazing opportunity! More details will come later (at the end of May – so be sure to stick around), but I could hardly contain my excitement and I wanted to share it ASAP so that you’ll be sure to visit and enter for a chance to win a trip for two and take an enjoyable, edible journey to Dijon, France. I almost wish I could enter myself…but, then I’d have nothing to offer you! So, let’s get started with a new recipe that we’ve fallen head-over-heels in love with. Mashed Cauliflower. Of course, this time with a flavorful, savory twist. The secret is in the Whole Grain Dijon Mustard. Mashed Cauliflower has been called everything from Mock Mashed Potatoes, to Pureed Cauliflower, to Whipped Cauliflower. No matter what you call them – they are here and here to stay. 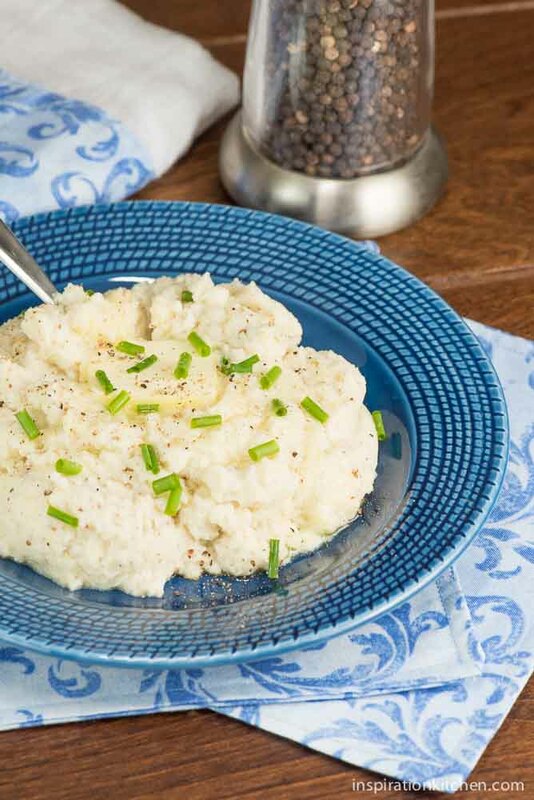 Here’s just a few delicious variations of Mashed Cauliflower that’s loved by people who have tried it. Whether you make the cauliflower in its simplest form with a bit of butter and a dash of salt and pepper, or whether you switch it up with Whole Grain Dijon Mustard like I did, cauliflower is making news. How can it not? It’s so versatile! You can get all fancy with it and dress it up by adding any combination of the following: gruyere cheese, horseradish, garlic, parmesan, spinach, feta, ranch dressing – and the list goes on. The ever popular blog Pinch Of Yum even wrote a cookbook called The Creamy Cauliflower Sauce eCookbook. If you want to get a copy, you can purchase it by clicking the 30 Creamy Cauliflower Recipes image below. Please know that this is an affiliate link and if you choose to purchase this ecookbook, I receive a small commission on the sale. 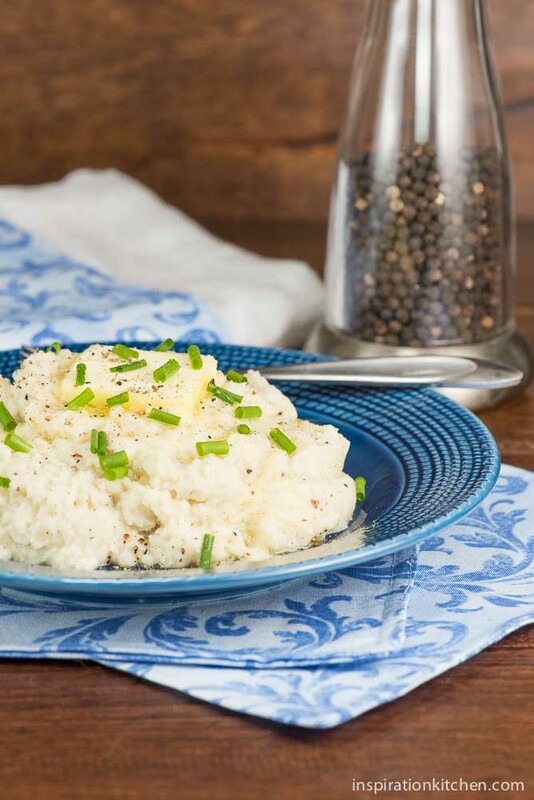 What we loved about this Whole Grain Dijon Mustard Mashed Cauliflower dish is that it goes well with all different proteins, such as pork tenderloin, sirloin steaks, chicken, roasts, etc. Try it! Cauliflower is an excellent canvas for other flavors. You won’t be disappointed. I can hardly wait to show you what I paired it with at the end of May. Hint, hint…it’s amazing and sssssooooo flavorful – you’ll love it! 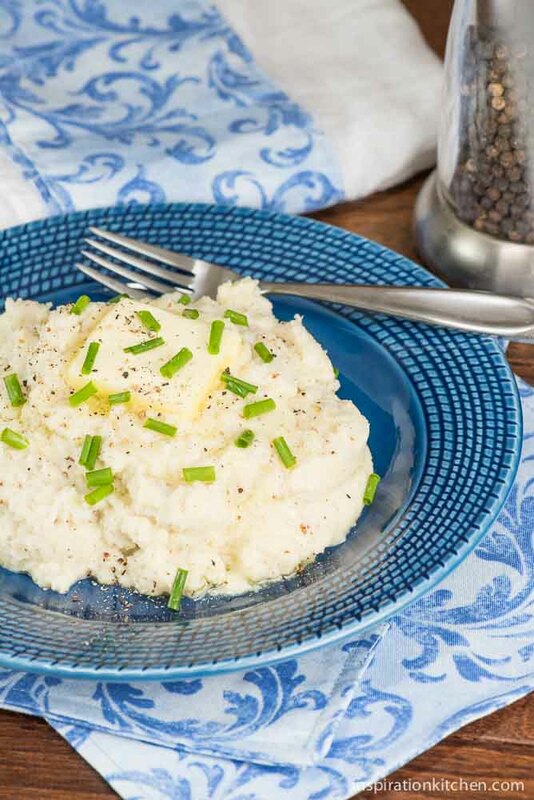 This Whole Grain Dijon Mustard Mashed Cauliflower recipe packs amazing flavor and is a healthy alternative to mashed potatoes. Place a large stock pot of water on the stove over high heat. Add cut cauliflower to water and heat to boiling. Turn down to medium-high and cook until cauliflower is tender (6-8 minutes, depending how big your cauliflower pieces are). Remove from heat and drain well. Add all ingredients (except the garnishes!) and using an immersion blender or food processor, puree until nearly smooth. Serve with butter and top with chives, if desired. *Use a high quality whole grain dijon mustard for the best flavor. I used Maille Whole Grain Dijon Mustard. **Omit chicken bouillion powder to make a vegetarian version of this dish. I’ll keep my fingers crossed Dorothy! I’d love to win a chance too – so I know what you mean. Good luck! I’ll let you know when you can enter. Mustard is one of my favorite things – I just love it, and I love it in all forms. Whole grain, country mustard, dijon, flavored – you name it. I heart it like crazy talk! And I’d never had mashed cauliflower either Marcie, but I’ve had it several times since and we absolutely adored it – so I know you will love it too. Have a fabulous weekend my dear friend, and thank you for the pin. xoxo! This seems very delicious and I think I need to give it a try this weekend! You should totally try it Lubna! I think you’ll love it as much as we did! Very cool! That’s so exciting Kristi! And I LOVE mashed cauliflower – you’re speaking my love language here haha And with the dijon?? I’ve never added that in but now I definitely need to try! I’ve never tried mashed cauliflower before, but it looks delicious! These would go so great with any dinner too. Thank you Danielle! They are really good. I would not say they are a replacement for potatoes, but they are an option to mashed potatoes and bring their own special flavor. We loved them! Have a great weekend! Looks and sounds soo delicious. Love the idea. Thanks Ella! I am always looking for new, savory side dishes. One can never have to many in their recipe box! I’m a big fan of dijon mustard – I’m not above licking the spoon (but don’t tell anyone 😉 ) I also love cauliflower mashed potatoes so this is pretty much a match made in heaven! Yay, so fun! A trip to France would be amazing! Love this recipe too! ! I am a big fan of mashed cauliflower but have never tried adding dijon mustard, such a great idea! It sounds fantastic and I can’t wait to try it! Oh wow, Dijon! That’s awesome! I went there about 10 years ago when I was studying abroad in Paris and it was SO quaint and pretty! <3 This cauliflower sounds great… I love all types of mustard! Really Jess? I am so jealous! I would love to go there, and I can imagine that it *is* quaint and fabulous. Just know I’m swooning over the fact you got to go! What a great combination of flavors. Maille is my favorite mustard! Thanks Vicky & Ruth! 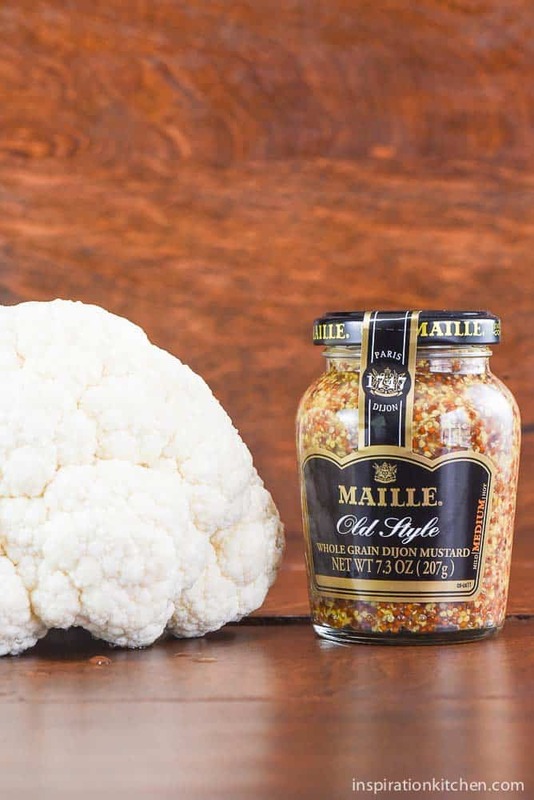 I use Maille too – it is an amazing brand, and I keep all three flavors we carry at our story in my pantry. I never tried mashed cauliflower, mostly because I’m not a fan of cauliflower. This looks great and I now really want to give cauliflower a try!